Once the cars were all lubed up, the races went much better. No more cars failed to finish across the finish line. Oh there were a few fiery crashes, but no lives were lost in all of it. The boys (and boys disguised as men) had a great time and all came away happy. 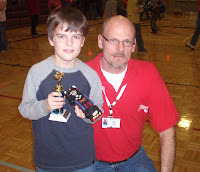 Ben even managed to win a trophy for "2nd place Best Design). So, all that hard work and angst put into building the cars actually paid off in the end. In keeping with my intnetions of accomplishing some goals this year, I enrolled in a Yoga class. I did it with great trepidation and am still not sure what i've gotten myself into. The class meets twice a week, at work, after work. Of course I'm the only man among 12 ladies or so. I knew that would happen. I've heard so many people recommend it to me for everything from carpal tunnel to my back to just feeling better. The first session was pretty funny from my perspective. Funny because though I'm in shape, I'm NOT flexible at all. I knew this going in, this course just confirmed that. Furthermore, I figured I'm in pretty good shape, so I can take a little stretching, no prob. Well the Yoga I saw that night was a whole lot more than a little stretching. Can you say muscle spasms? Shaking legs and trunk? Yeah, that was me. The upside to it all was that when it was all over and done with I felt great! Absolutely euphoric, in a way that's hard to describe. Maybe I'm reading more into it than what's there, but it was good, whatever it was. So, I plan to keep it up for the 6 weeks and see what comes of it. If I turn vegetarian and start talking about feng shui, feel free to stage an intervention. The only thing worse than a yoga wierdo is a preachy-yoga wierdo.